Sale of crops is the main source of income for agricultural workers. Rainfall is very important for the proper growth and maturity of crops. Lack of rain is the primary cause for crop failure. Only artificial methods of irrigation can save the produce. But rural agricultural workers cannot afford to pay for expensive pump sets and necessary power. 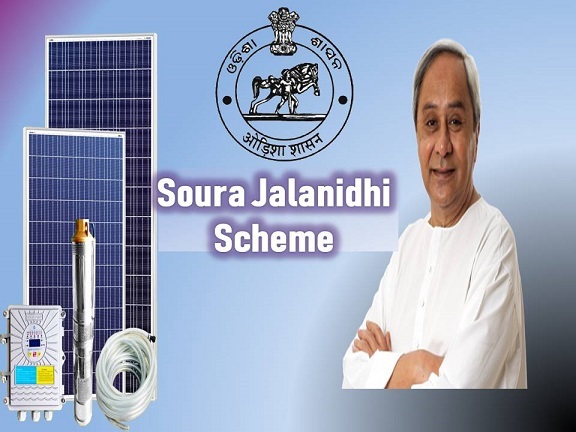 Thus, Odisha government has decided to offer subsidy on solar pumps under the Soura Jalanidhi Scheme. Development of agriculture – The agricultural department has highlighted that the distribution of pumps, operated by solar power, will pave the path for development of overall crop production. Reduce irrigational issues – Rural farmers find it difficult to cultivate their lands due to shortage of irrigation mechanism. With the implementation of this scheme, farmers will be able to resolve their irrigational issues with these pumps. Lower pressure on electricity supply – There is already heavy scarcity of electricity in rural Odisha. These solar pumps will put surplus power on the grid. This power can be used to light up rural homes. Earlier, farmers had to purchase power to operate their irrigation pumps. Total area – With the implementation of this agricultural reform project, it will be possible to irrigate 2500 acres of agricultural plot. Total number of pumps – At the onset, the state will give out solar pumps to as many as 2000 applicants. The scheme is open for farmers from all parts of Odisha. Amount of subsidy offered – As per the details of this project, agricultural labors will attain 90% discount on the irrigational pumps, which are powered by solar rays. Farmers only – Only people who are associated with the agricultural sector will be able to get financial assistance for solar power pumps. The state will pay attention to offering the pumps to farmers who belong to financially weak groups. Residential requirements – All financial requirements, for distribution so many, pumps will be arranged by the Odisha government. If the agricultural workers do not possess their residential documents, they will not be able to apply. This program is only for Odisha residents. Bank details – The financial subsidy will be sent to each registering applicant via the bank account. So, the farmers need to submit their bank account details. How to get application form and apply online? The state authority has launched a separate portal for taking care of the registration process. The online application form is available on http://odishasolarpump.nic.in/. It is the only way to apply for the subsidy. Once the main page comes up, applicants will have to click on the option that is marked as “Apply Online”. It will bring up a different online applicant form. All interested applicants will have to fill in the necessary details in the digitized registration form. To complete and save the online enrollment, candidates have to click on the “Login” option. It is present on the right top corner of the home page. The applicants need to type on their ID and passwords to register their application. Better agricultural will bring in more profit for the farmers. More income for the agricultural workers will pave the path for overall development of the state. These pumps will replace fossil fuel or electricity powered irrigation machines. With this replacement, it will be possible to reduce air pollution. We will offer more information about the scheme once the state authority proceeds with the enrollment procedure.